Here are some photos from tonight’s Grammy Awards. The show just started, but here are some pictures from the red carpet. 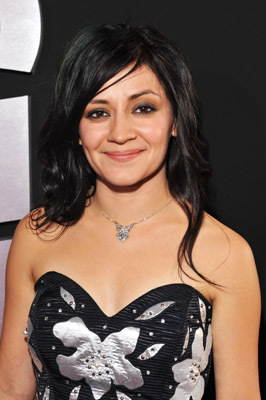 Lacey was nominated twice along with Third Day for her vocal work on the song Born Again. They didn’t win for the two Lacey was a part of, but Third Day did win for Best Rock Or Rap Gospel Album, so congratulations to them! Click the pictures below for some more shots. I’ll add more as they become available. She is so pretty! I love her outfit as well! I'm so excited for her, that she was nominated for 2 Grammys!! I watched Lacey walk the red carpet live on TVguide.com when the Grammys started. She looked amazing!!! She deserved to be on the top 10 best dressed list because she was just plain gorgeous ! She looks so pretty. I watched the red carpet stuff, but I didn't see her at all…lame. I love Lacey for her voice and for the amzing person that she is but msn got it right she looks hot in a classy way. awe! she looked great! thats funny that msn had her as a "grammy hottie" hopefully next year we'll see them all on the red carpet for their own nomination! wow…she looks gorgeous!! ive never seen her so dressed up before…love the shoes!! she looks like a red-carpet pro! simply beautiful! :) im sorry i missed it..God Bless you all! She was on the red carpet!!! I saw her live on TVguide.com She was amazing & total glam!! STUNNING!! LOVE HER VOICE AND TALENT LOVE YOU LACY! LACEy)You awe Fantasic! !I love you since 2006!!!!really! !